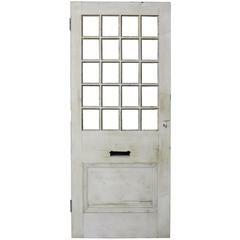 About An unusual antique Georgian style front door with raised and fielded panels to the front, diagonal planks to the reverse. The hinges have been made by a blacksmith, the door is brown and from England. Condition report: Stripped finish and in good structural condition. The hinges are present, the locks have not been tested. There is a letter box fitted. The kick board has been replaced. Style: Georgian Materials and techniques: Handcrafted, pine, wrought iron hinges. Wear -Wear consistent with age and use -Minor Losses, scuffs and scratches -Historic repairs -Recent repairs Dimensions: Height 191.5 cm Width 96.5 cm Thickness 6 cm Weight 62 kg. 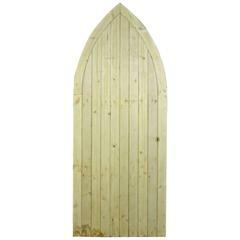 These doors are supplied unglazed. 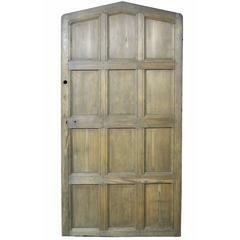 This door has been stripped and sanded. It would be possible to reduce height anything down to 212cm and reduce the width anything down to 100cm. Height to the shoulder 153 cm. This door is made from pine.